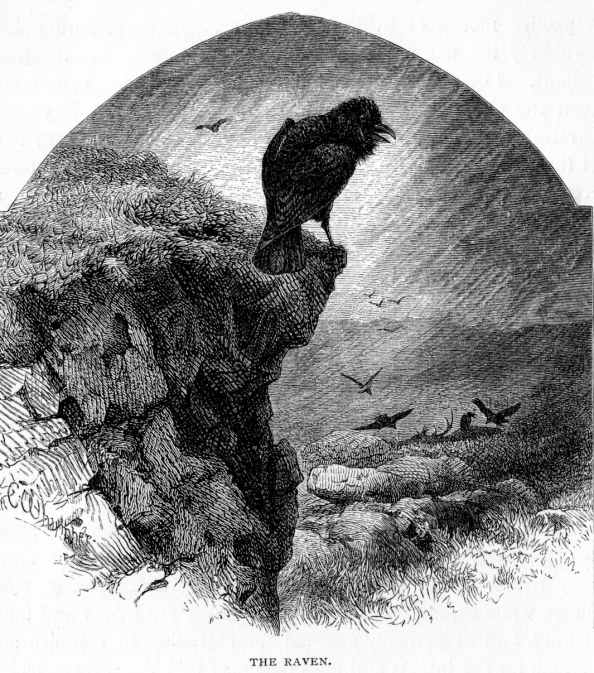 Thus also the beak of these carnivorous birds is formed for tearing and rending, while the strong wedge-shaped mandibles of the raven and carrion-crow are the best possible implements for the half-digging, half-cutting work which they are called upon to perform in devouring the dead carcasses of large animals. The goosander and merganser, who feed principally on small eels and fish, have a row of teeth-like projections inside their bill, which, slanting inwards, admits of the easy entrance of their slippery prey, but effectually prevents its escape ; while the cormorant, whose food consists of larger fish, instead of these numerous teeth has a strong curved beak, well fitted for holding the strongest sea-trout or haddock. Put your finger into the bill of a common duck, and you will see how easily it goes in but how difficult it is to draw it out again, in consequence of the sloping projections, by means of which the bird is enabled to hold worms and snails. No bill but that of a crossbill could cut and divide the strong fir-cones from which it extracts its food. The common woodpecker bores holes with its strongly-tipped wedge-shaped bill in the hard beech-trees with a precision and regularity not to be excelled by the best carpenter; while with its long worm-like tongue it darts upon and catches the small insects which take refuge in the chinks and crevices of the bark. The swallows, who catch their insect prey while flying at speed in the air, are provided with large wide-opening mouths, which enables them to capture the swiftest flying moth or midge. In fact, if we take the trouble to examine the manner of feeding and the structure of the commonest birds, which we pass over without observation in consequence of their want of rarity, we see that the Providence that has made them has also adapted each in the most perfect manner for acquiring with facility the food on which it is designed to live. The owl, that preys mostly on the quick-eared mouse, has its wings edged with a kind of downy fringe, which makes its flight silent and inaudible in the still evening air. Were its wings formed of the same kind of plumage as those of most other birds, it is so slow a flier that the mouse, warned by the rustling of its approach, would escape long before it could pounce upon it. The heron has also a quantity of downy plumage about its wings, which are also of a very concave form, and the bird alights in the calm pool without making a ripple, and whilst standing motionless, knee-deep in the water, it is almost invisible in the gloom of evening, owing to its grey and shadowy colour. So also is the colour of the wild duck, partridge, and other birds who hatch on the ground, exactly similar in its shade to the dry foliage amongst which they sit — insomuch so, that even when they are pointed out to one by another person, it is very difficult to distinguish these birds. How curiously quick is the instinct of birds in finding out their food. Where peas or other favourite grain is sown, wood pigeons and tame pigeons immediately congregate. It is not easy to ascertain from whence the former come, but the house-pigeons have often been known to arrive in numbers on a new-sown field the very morning after the grain is laid down, although no pigeon-house from which they could come exists within several miles of the place. Put down a handful or two of unthrashed oat straw in almost any situation near the sea-coast where there are wild ducks, and they are sure to find it out the first or second night after it has been left there. There are many almost incredible stories of the acuteness of the raven's instinct in guiding it to the dead carcass of any large animal, or even in leading it to the neighbourhood on the near approach of death. I myself have known several instances of the raven finding out dead bodies of animals in a very short space of time. One instance struck me very much. I had wounded a stag on a Wednesday. The following Friday I was crossing the hills at some distance from the place, but in the direction towards which the deer had gone. Two ravens passed me, flying in a steady straight course. Soon again two more flew by, and two others followed, all coming from different directions, but making direct for the same point. "'Deed, Sir," said the Highlander with me, "the corbies have just found the staig; he will be lying dead about the head of the muckle burn." By tracing the course of the birds, we found that the man's conjecture was correct, as the deer was lying within a mile of us, and the ravens were making for its carcass. The animal had evidently only died the day before, but the birds had already made their breakfast upon him, and were now on their way to their evening meal. Though occasionally we had seen a pair of ravens soaring high over head in that district, we never saw more than that number; but now there were some six or seven pairs already collected — where from we knew not. When a whale or other large fish is driven ashore on the coast of any of the northern islands, the ravens collect in amazing numbers, almost immediately coming from all directions and from all distances, led by the unerring instinct which tells them that a feast is to be found in a particular spot. Ducks go out to the grass-fields to search for the snails which they know will be found before the coming shower; the field-mouse covers up her hole in due time before the setting in of cold weather. Fish have the strongest instinct with regard to changes of the weather, refusing obstinately to rise at the most tempting baits or flies when clouds charged with thunder or rain are passing through the air. Indeed, most birds and animals have a singular foreknowledge of changes in the weather; shifting their quarters according as the coming rain or the dryness of the atmosphere warns them. 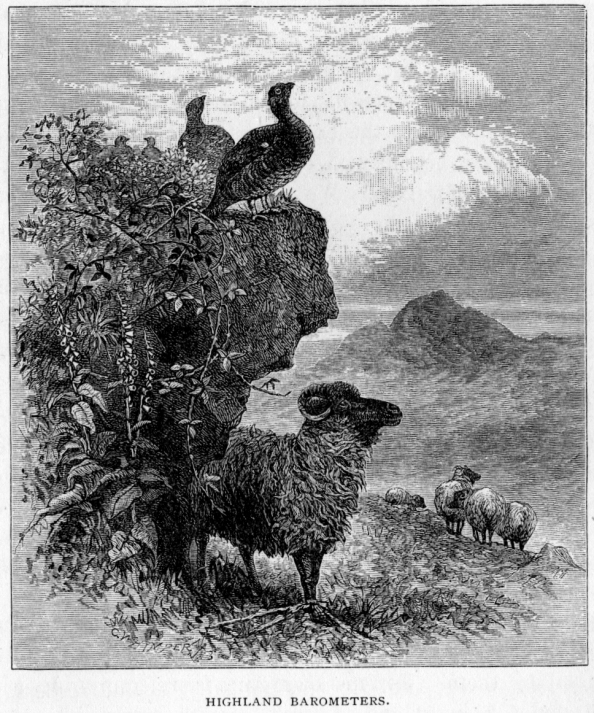 The grouse foretell the approaching rains before the most weather-wise shepherd can do so, by betaking themselves to the dry heights, where they sit or walk about with erect heads and necks, in quite a different manner to their usual gait. So do the mountain sheep change their feeding-ground to the lee side of the hills before severe blasts of wind and rain. I have often been warned of an approaching change in the weather by the proceedings of the wild fowl in the bay; and before changes of wind these birds betake themselves to those places which will afford them the best shelter during the coming storm. There are few animals which do not afford timely and sure prognostications of changes in the weather. It is proverbial that pigs see the wind; and they undoubtedly become restless, and prepare their straw beds prior to a severe storm, some hours before human organs are aware of its approach. In fine, there is matter not only for amusement but for admiration in the actions and habits of every animal that we see, even down to the most common small birds and quadrupeds and the unoccupied man may always find wherewithal to amuse himself profitably in watching the instinct which prompts the every-day proceeding of the animals which are always around us.